Villa Silvio Pellico is the name of a charming historical estate, formerly owned by the Marquess of Barolo and mostly used in summertime as a leisure lodge. The main house has been rebuilt at the end of the XVIIIth century in accordance with the neoclassic style and the interiors were fitted consistently with the aesthetic taste of the time. Around 1810 the Marchioness added a new wing in the early neogothic style, encompassing a church and a small square building imitating a stony old medieval castle (these additions appear to be the first example of neogothic in Piedmont); another building was added at the end of the XIXth century at the entrance of the estate where the main iron gate was placed. 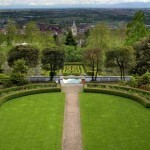 The Villa and the estate was originally a “vigna” (literally a “vineyard”, though rather intended in the old times as a “gentilhommière de plaisance”), a refuge from the heat of the Turin summer. The owners of the place were until the end of the XIXth century, the Marquesses of Barolo, one of the most prominent and affluent families of the small Savoy Dukedom, later Kingdom of Sardinia and then of Italy. The elder son of Marquess Barolo, during the Napoleon’s reign over Piedmont, married (possibly to please the new Emperor) a French girl, Julie Colbert, a scion of the famed Ministry of Finance of Louis XIV. The young Marchioness turned out to be a cultivated and enlightened lady, much in advance of her time. She entertained strong relations with most of the rulers of the Italian States before the Kingdom of Italy was created, namely King Carlo Alberto and the Popes in Rome. She founded a charitable foundation, still operating in Piedmont and an order of missionary nuns. The Marchioness of Barolo used to spend in the Villa two or three months each year. 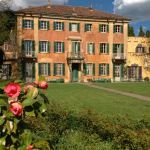 She hired the famous Italian patriot and writer Silvio Pellico as her personal secretary, certainly unaware that the writer’s fame fifty years later would have shadowed her own to the point that the new owner (the wealthy Baron Milius) renamed the Villa after him. Silvio Pellico bestseller Le mie prigioni was written here. The estate, upon the Marchioness death, became an orphanage under the patronage of the Barolo Foundation until it was resolved that the Villa should return to its original destination and it was then sold to an affluent banker and industrialist, the bachelor Baron Milius, who loved the place, restored the gardens and spent here some time in the summer until his death at the beginning of XXth century. The Baron, a worshiper of the late Marchioness, bequeathed the estate to the Barolo Foundation. The latter resolved to sell it to private users. Between 1920 and 1948 the estate changed several owners, mostly attracted by the woods and the exploitation of the surrounding land. In 1948 a young heiress, wishing to set down near Turin with her children, bought the neglected place and saved it from ruin. 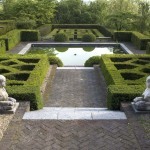 The garden is a perfect synthesis of modernity and revisited classicism. When the lady who saved the estate and her husband died, their heirs, unable to keep the place as a main dwelling, decided to sell it to a couple that they have known for decades as the ideal successors to fulfill the cumbersome task of preservation and improvement. The new owners devote constant effort and personal commitment to keep house and garden in excellent condition, hoping that future generations will be able to see in it all the beauty that has been gradually created out of an intelligent blend of versatile cultural inspirations. The interiors of the Villa are quite consistent with the stylish gardens and retain a soft eighteenth century neoclassical spirit combined with a much livable “family house” atmosphere. Furniture is mostly eighteenth century French and Italian. Many signs of the remarkable presence of the lively spirit of the Marchioness of Barolo still subsist, such as marble bas-reliefs, floral stuccos and elegant boiseries. Quite remarkable are the micromosaics (third and fifth century, roman and byzantine respectively) donated by the Pope of Rome to the Marchioness in sign of gratitude for the aid provided in the reconstruction of the Saint Paul Cathedral in Rome destroyed by fire in the first half of the XIXth century.